Just a quick post today to announce yet another art exhibit I am participating in – Duxbury Art Association‘s ‘By The Sea Shore – Art Inspired by the Beach‘! This gallery exhibition will feature original two-dimensional & three-dimensional works of art in all mediums. 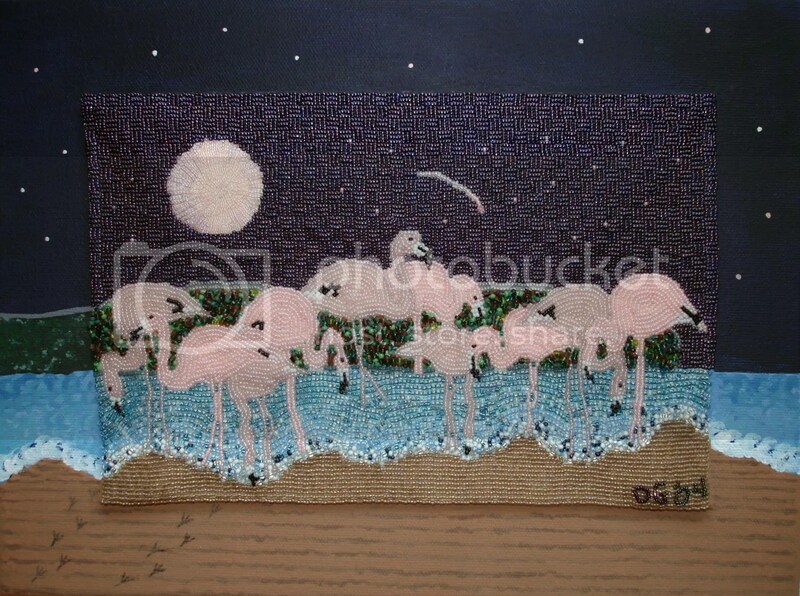 Most works will be available for sale, including my beaded painting, Flamingo Moon! Flamingo Moon. Bead embroidery on canvas. 9″ x 12″. Exhibit runs from June 10 – July 19. Opening reception is this Thursday, June 10, 6-8pm. Please see the DAA’s website for more information. >What an amazing beaded painting. Your work never ceases to amaze and inspire me! Access my Free Intro to Extreme Bead Embroidery Tutorial! Lone Beader (n) 1. one who creates beadwork without the assistance or company of others. 2. one who prefers solitude while creating beadwork. Shop from a selection of my favorite books, beading supplies and earth-friendly products at The Lone Beader’s Amazon Influencer Page. The Lone Beader is a participant in the Amazon Services LLC Associates Program, an affiliate advertising program designed to provide a means for us to earn fees by linking to Amazon.com and affiliated sites.